A Soros-funded organization called "Free Press" on Wednesday launched a petition to demand Facebook ban radio host Alex Jones "permanently." "Hateful conspiracy theorist Alex Jones is back on Facebook just a few months after the site kicked him off," Free Press tweeted. "Urge Facebook to ban him permanently." 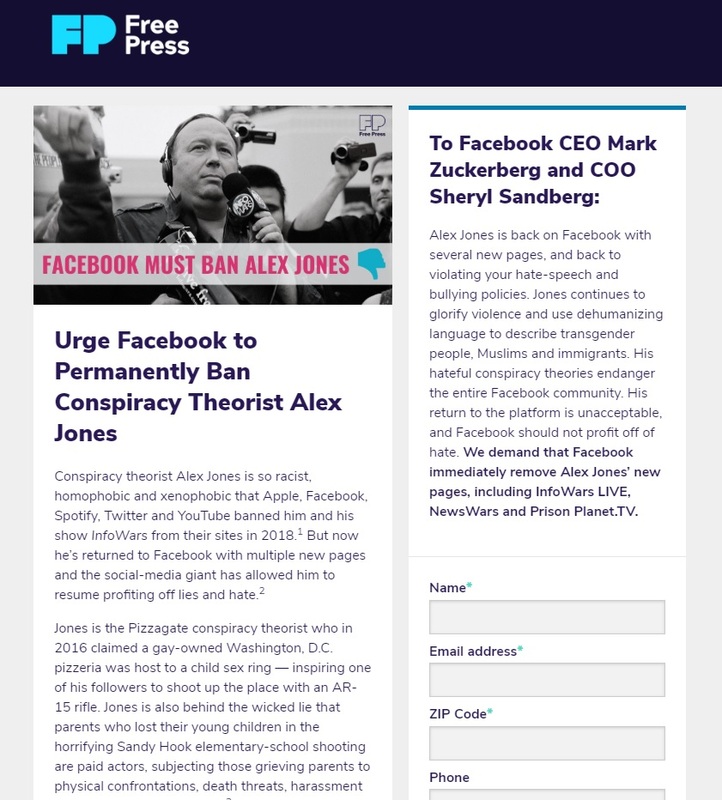 They linked to a petition on their website urging Mark Zuckerberg and Sheryl Sandberg to ban several pages which may possibly be affiliated with Jones for "hate speech." "Tell Facebook to banish these new pages — including Infowars LIVE, NewsWars and Prison Planet.TV — that showcase Alex Jones’ hate," the petition says. The goal of the petition appears to be to get leftist suckers to give them their personal information so they can build their email list. 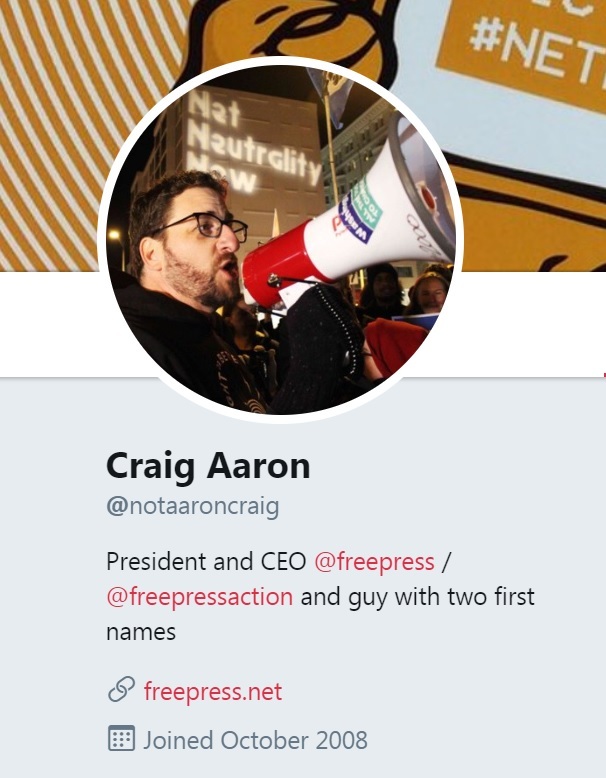 The president of "Free Press" is Craig Aaron who bills himself as an advocate for net neutrality. Aaron -- who uses the fear of a future where corporations take control of the internet and decide what websites people are allowed to see to push net neutrality -- is now advocating for one of the biggest corporations in the world to censor a political dissident for going against the establishment. You'll no doubt be shocked to learn "Free Press" is funded by George Soros through the Open Society Foundation. "The activist group has big money behinds its effort. It has received $2.2 million in donations from progressive billionaire George Soros’ Open Society Foundations and $3.9 million from the Ford Foundation," The Daily Caller reported in 2015. Alex Jones has been a major critic of both George Soros and the Ford Foundation. The irony of an organization called "Free Press" demanding press censorship was not lost on anyone as their tweet got "ratioed" to hell. “Free press” campaigning for censorship, nice. Free Press: "We’re a nonpartisan organization fighting for your rights to connect and communicate." On Wednesday, Roku banned a fan-created Alex Jones channel just hours after saying they were OK with it and refuse to "censor" channels "based on viewpoint." "Roku says that Infowars hasn't broken any of its rules," The Verge reported shortly before the banning. They later reversed their decision, deleted their tweet defending free speech and banned the Alex Jones channel entirely.